I’m one week into my holiday and I’ve managed to read three books already that featured vacationing characters. I feel an immediate sympathy between myself and a book when this sort of coincidence occurs, though there is also a kind of comparison that happens: is their (fictional) holiday more appealing than mine? Would I rather be off having the kind of adventures they are having? But I am very happy where I am right now, thank you very much, and happier still to be able to share in these fictional holidays at the same time. 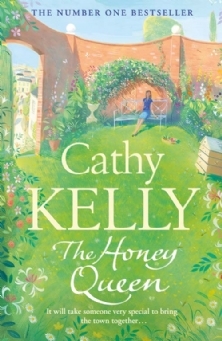 I had never heard of The Honey Queen by Cathy Kelly but that’s probably because it just came out this year. I’d never read anything by Kelly before but, if this is anything to go by, she’s very Maeve Binchy-esque and I mean that in the best possible way. Set just outside Cork, The Honey Queen focuses on a perhaps slightly too large cast of characters and the struggles facing each of them. The highlight is the friendly and always sympathetic Lillian. In her sixties, Lillie was given up for adoption at birth and taken in by an Australian family. Recently widowed, she is still coming to terms with her husband’s death when her sons discover that she has a younger brother, Seth, in Ireland. Seth immediately invites her to visit and Lillie, a little to her surprise, finds herself agreeing to come. Lillie and Seth’s scenes made me tear up far more often than I should probably admit but as it is the purpose of heart-warming women’s fiction to elicit such tears I felt quite satisfied. Lillie recognizes that Seth is going through a difficult period in his marriage and does her best to take the pressure off of him and his wife, Frankie, and allow them the time to figure things out. She’s rather Mary Poppins-like, but less severe. But this is only one of several households featured in the novel and all of them are interesting. There’s even a twenty-something female character who opens up a knitting and sewing shop – something I know will appeal to some of my readers! I will definitely be looking out for more Cathy Kelly books when I get home to the library. 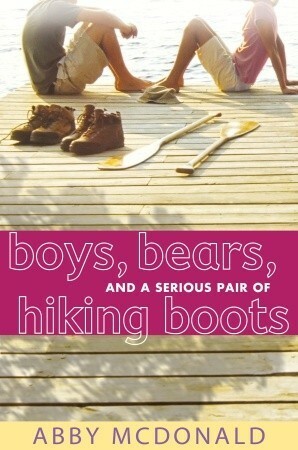 Boys, Bears, and a Serious Pair of Hiking Boots by Abby McDonald was a surprise. I found it while combing through the library’s e-book catalogue and, being intrigued by the blurb, downloaded this YA novel about a suburban New Jersey teenager who spends a summer with her godmother in the British Columbian Interior. Jenna is an industrious seventeen year old who is devoted to environmental issues. She cheerfully organizes protests and rallies, knows how to charm people into signing her petitions, and loves having equally passionate friends in her school’s Green Teen group. With her parents heading (separately) out of town for the summer, Jenna finds herself going off to stay with her newly married godmother, Susie, in a small town in BC, where Jenna’s environmentalist beliefs clash with the reality of life in the wilderness. Generally, my issues with romantic YA fiction overlap quite closely with my arguments against chick-lit: I can’t stand books about girls and women who spend all their time thinking about boys and how they look. Thankfully, Jenna does very little of this and her only concern with footwear (the most annoying chick-lit cliché) is with having waterproof boots appropriate for outdoor pursuits. Clearly, a girl after my own heart. There are boys – they’re right there in the title – but they are Jenna’s friends before anything romantic begins to develop, the guys who take her rafting, fishing, rock climbing, and hiking. That’s part of the real appeal of this book for me: Jenna does stuff. A lot of stuff. She throws herself into projects and I loved her excitement over the tourism website she and her new friends build, highlighting all the local outdoor activities, and the B&B that Susie and her husband are opening. Jenna has her insecurities and concerns but mostly she is a confident, positive young woman with lots of energy that she’s trying to figure out how to channel. She reminds me far more of myself as a teen than most fictional heroines do. 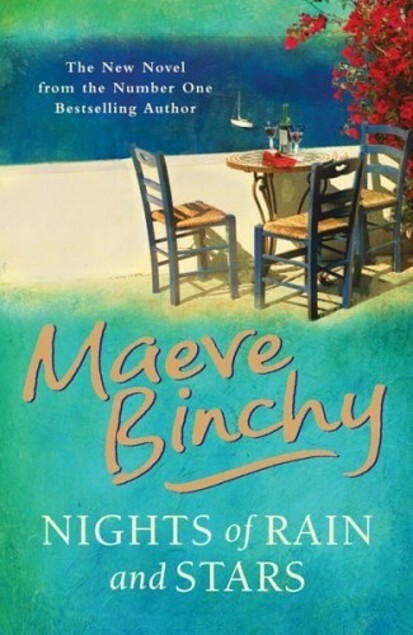 Most recently, I reread Nights of Rain and Stars by Maeve Binchy. There’s nothing quite like a Maeve Binchy when you’re on holiday and no matter how many times I read her books I am always happy to pick them up again. (In fact, since finishing this one I’ve started rereading Scarlet Feather, one of my favourite Binchys.) Nights of Rain and Stars focuses on four travellers who witness a tragedy in the Greek town where they are staying. 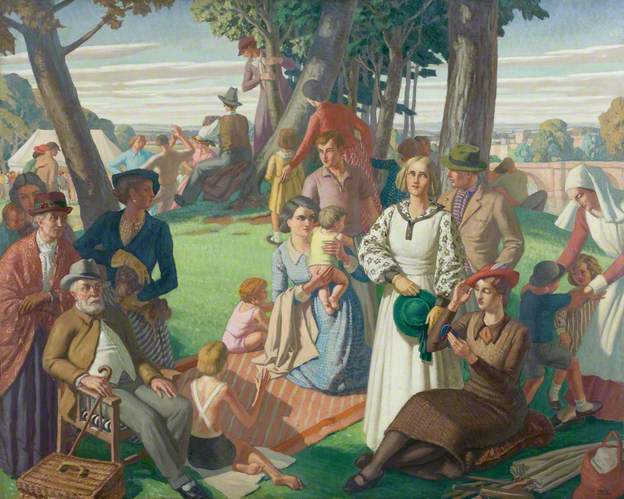 Away from their homelands, the four characters – Thomas, David, Elsa, and Fiona – find themselves drawn to the small community as they try and escape the problems they left behind. Thomas, an academic on sabbatical, is missing his son back in California and dreading the influence the boy’s new stepfather will have on him. David, a quiet and sensitive young Englishman, is avoiding the parents who expect him to go into the successful family business. Elsa, a former news presenter, is trying to escape an old lover back in Germany and Fiona, a young Irish nurse, is clinging to the ne’er-do-well boyfriend her family and friends disapprove of. With guidance from Vonni, an Irishwoman who’s been in Greece long enough to count as a local, they slowly begin to get their lives in order and face up to the conflicts they had thought to escape. This isn’t Binchy’s best but it is still delightful. Cathy Kelly might be Binchy-esque but nothing beats a bona fide Binchy. Last time I read Nights of Rain and Stars, it was the dead of winter (or, you know, possibly April) in Calgary and I remember being holed up inside while a blizzard raged outside. This time, I read it in the sunshine, hiding under an umbrella from the hot sun. In either climate, it was a treat. I have only a few more days left before we begin the drive home so will hopefully get some more suitably vacation-y reading in between now and then! It all sounds lovely. 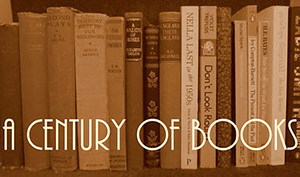 My reading tends to be quite different; science fiction and mystery as well as old pulp fiction originally published in the 1930s and 1940s. Still, this kind of thing holds an occasional appeal so it’s nice to know where to turn when that appeal is felt. Have a safe drive! I tend to pick very different books based on where we go for vacation. Great picks. Hope u have been doing well Claire.